Apart from the Tohono O'Odham Indian Reservation, and several military reservations north and east of Yuma, all of the desert land in southwest Arizona is open for public use, largely unregulated - either in protected reserves like the Organ Pipe, Sonoran Desert and Ironwood Forest national monuments, or undesignated land such as the areas either side of interstate 10. Away from the main roads, all this part of the state is remote, and is very hot and dry for much of the year, but the 860,010 acre Cabeza Prieta National Wildlife Refuge (3rd largest NWR in the US outside Alaska) is the most isolated and extreme region of all. Temperatures exceed 110°F for many weeks each summer, rainfall is almost non existent for some months of the year and natural water sources are very limited, the few roads (4WD only) are rough and/or sandy, and the region is a long way from any towns or facilities - up to 50 miles. The other standard desert dangers of spiky plants and poisonous creatures apply, together with more unusual problems of uncovered mine shafts, unexploded ordnance from the adjacent Barry M Goldwater Air Force Range, and issues with illegal immigration and drug trafficking - the refuge shares a 56 mile border with Mexico, largely unprotected, and a typical night may see several dozen people moving northwards through the desert hoping to reach interstate 8, a cross country trip of at least 25 miles. The peace and quiet of the desert is often interrupted by noise of jets from the air force base, and all the back roads are frequently traveled by the Border Patrol, so this is not necessarily a good place to find solitude. Trash, damage caused by camps and fires, and numerous tracks from unlawful off road driving have all harmed the natural environment, though despite all these issues the refuge still provides a memorable wilderness experience for those suitably prepared. Around 400 types of plant and 300 animal species can be found here, most endangered being Sonoran pronghorn antelope, on account of which access may be restricted during the fawning season (May to July). Most of the refuge consists of wide, flat desert valleys, separated by narrow volcanic mountain ranges running north-south, all densely covered with saguaro, cholla and other cacti, palo verde, ironwoods, ocotillo and mesquite. The most used entry into the NWR is via Charlie Bell Road, starting in Ajo along AZ 85, but all prospective visitors must first stop at the refuge headquarters to acquire a free permit, be instructed about the multiple dangers ahead, and sign a disclaimer form ('Military Hold Harmless Agreement'), absolving the authorities of any responsibility in the event of accident. Charlie Bell Road is generally suitable for 2WD vehicles for the first 16 miles or so, as far as the Growler Mountains; beyond here it deteriorates, though this section is currently closed to the public. The office is open weekdays only, and is located on the west side of the highway, about one mile north of the town center. The route to the refuge starts one block north (Rasmussen Road) - this soon becomes unpaved, crossing sandy scrubland towards a range of hills (Childs Mountain), 3 miles distant. The track passes several small dry washes and a few junctions before arriving at the refuge entrance gate, marked with a variety of warning notices. Already the landscape is quite striking - ahead lies a great empty plain, without any visible roads or other structures, quite densely carpeted by saguaro and cholla cacti, stretching to the next range of hills (Growler Mountains), 8 miles west. The road continues alongside the edge of Childs Mountain a little way, veers south then back west, descending gradually through sandier terrain and across several larger dry washes, before climbing towards Charlie Bell Pass in the middle of the mountains, from where a short trail lead to petroglyphs and an old well. This is a good destination for day trips; further west, the road becomes rougher as it drops down to the sandy expanse of Growler Valley. 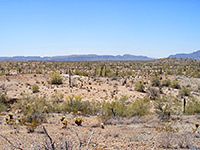 The main thoroughfare through the southern part of the wildlife refuge is a 120 mile dirt road between Ajo and Wellton (on I-8), most of which follows a famous cross-country route established by a Jesuit missionary (Padre Eusebio Kino) around 1700 and known for the last 200 years as El Camino del Diablo, on account of the many people who died along the way. 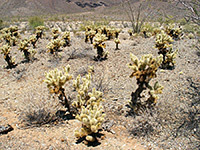 This can be picked up in the east via Bates Well Road, starting out southwards from Ajo - the road crosses part of the Organ Pipe Cactus National Monument, passes through the Agua Dulce Mountains then runs quite close to the international border for 40 miles before exiting the refuge and veering northwest across the Air Force Base towards I-8. The roughest sections are through the Cabeza Prieta Mountains towards the east of the refuge, and across the nearby Pinacate Lava Flow, a 5 mile wide patch of bumpy black rocks. The most remote and hostile area of desert in the US; dangers include extreme temperatures, lack of water and issues with illegal immigration, yet the lands are very scenic and still largely unspoilt.